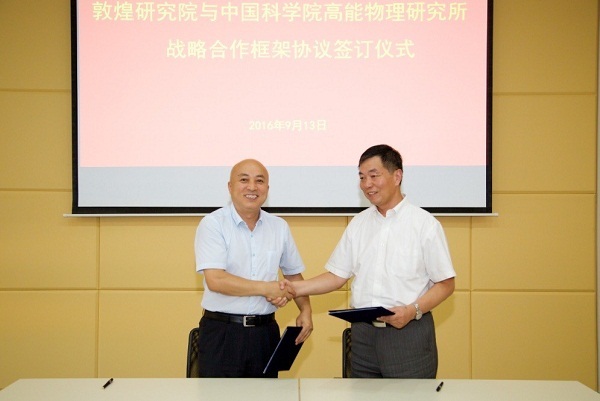 On September 13, the Institute of High Energy Physics (IHEP) signed a Memorandum of Understanding with the Dunhuang Research Academy (DHRA) to work together for the protection of the Cultural Relics of Dunhuang. Dunhuang Research Academy (DHRA) is a national comprehensive institution responsible for the conservation, management and research of the Mogao Grottoes (a world cultural heritage site at Dunhuang), the Yulin Grottoes (a nationally protected key cultural heritage site at Guazhou), and the Western Thousand-Buddha Grottoes at Dunhuang. As well as historical and cultural studies, the institute is working on ways to meet the urgent needs for advanced technology in the protection of cultural relics. These include conservation to restore and consolidate the cliff surface, caves, statues and murals; and digitization of videos and photographs of the caves and relics inside, including the creation of multi-media virtual tour presentations for visitors. The presentations, along with visits to the caves, will allow visitors to see more of the Dunhuang art in greater detail and help conserve the treasures inside the caves. IHEP and DHRA will use their respective expertise to cooperate strategically on research into protection of cultural heritage, R&D of conservation equipment, storage of resource information, information storage, network security, and personnel training. This is in response to the "One Belt, One Road" initiative proposed by Chinese President Xi Jinping in September 2013. Dunhuang Research Academy (DHRA) was first established in 1944 as the National Research Institute on Dunhuang Art, renamed the Research Institute on Cultural Relics of Dunhuang in 1950 and further broadened to the present DHRA in 1984.